DON'T MISS THIS ONE! 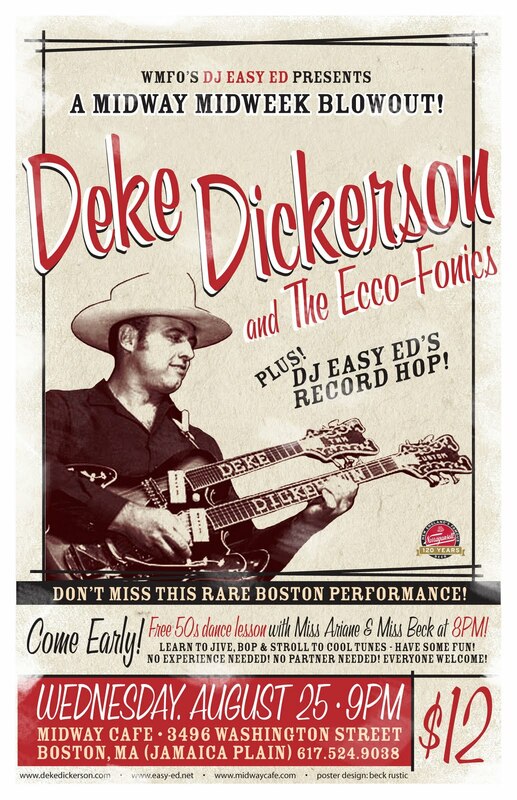 Come on down to the Midway on 8/25 for a fantastic night of entertainment with Deke Dickerson and the Ecco-Fonics, along with Easy Ed's Record Hop. Deke hasn't played in Boston in several years and who knows when he'll be back this way again. Grab your chance to see the king of the double-neck guitar in action. Deke will perform three sets, the first starting at 10:00. 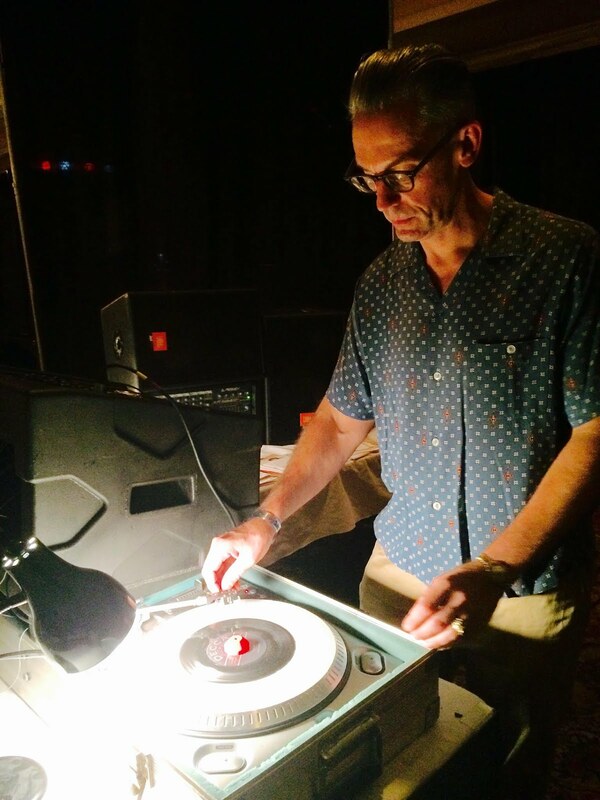 I'll be spinning beforehand, and we'll have an informal (fun!) dance class starting at 8:00 with Miss Ariane and Miss Beck. So come early and cut a rug (or just drink 'n' natter 'til Deke hits the stage). Poster design by Beck Rustic. Well, the suitcase is back at the pawn shop, the souvenir swizzle sticks are cluttering up the dashboard, and a heap of newly acquired records and CDs are hollerin’ “Play Me!” In other words, “Easy Ed’s Variety Hour” is back from vacation and ready to rip this Friday with two wham-bam hours of Rockabilly, Hillbilly, R&B, and 50s, early 60s Rock ‘n’ Roll! Please tune in, and don’t be bashful about those requests (dj_easy_ed@yahoo.com). On August 11 I will be the guest DJ at River Gods in Cambridge for Primitive Sounds night. Thanks to Jason Beek, P.J. Eastman, and the fine folks at River Gods for the invitation. Please stop by! The music starts at 9:00 PM. P.S. Below is a list of what I played on the last show. An archived MP3 is available for free download at www.easy-ed.net. Also, if you'd like to be removed from my mailing list just let me know. The Raging Teens “Hot Rod Boogie, #2” from The Raging Teens CD ALBUM (Annabelle Records 1998) – See The Raging Teens at Church in Boston on July 14, with Sonny Burgess, the Pinball Millionaires, the Raging Teens, and DJ Easy Ed! Sonny Burgess “Red Headed Woman” from The Sun Days: The Best of Sonny Burgess and The Pacers (Self-Released www.wendyrule.com) – Sun Records 1956/See Sonny Burgess at Church in Boston on July 14, with the Pinball Millionaires, the Raging Teens, and DJ Easy Ed! Jittery Jack “Tell Your Story Walkin’” from Preview track from forthcoming CD (Annabelle Records) – www.myspace.com/jitteryjack CD Release Party June 30 at TT the Bear’s. If you go, come on over to River Gods afterward. I’ll be spinning fer ya! I'm the host of "Easy Ed's Variety Hour" on WMFO in Medford, MA (91.5 FM/www.wmfo.org). I also DJ live in the Boston area.